Day 2- the outfit was an original navy 40’s suit I’d bought last year from Dress Circle, a pair of vintage sellers who have some of the best 40’s & 50’s vintage stock I’ve come across in the UK. They sell at events like the Twinwood Festival, the Hep Cats Holiday weekenders etc. So of course I bought a new suit from them while at Twinwood this time… the skirt had a choking 24″ waist which I’ve since made bigger – it’s a good thing garments from that period often have generous seam allowances! There was heavy rain in the night but we were cosy and dry in our lovely new bell tent which my husband recently bought as a lure to get me camping. sleeping bags make me feel claustrophobic so after a couple of nightmare camping trips (flash back to 10 years ago, France- giant spiders in the loo’s and mad foxes trying to break into the tent. 8 years ago, Pembrokeshire – 3 days of torrential rain, 2 grizzling children and more giant spiders in loo’s) I’ve held my ground and flat out refused to go. But this time we were equipped with a huge comfy air mattress and brought rugs, duvet, quilts, decent cooking equipment and even a tea-light chandelier … tons of kit, a bit like a minor Royal Progress and definitely not what you’d call economy camping but I loved it this time! I’m not a morning person but did look more cheerful after I drank that cup of coffee. 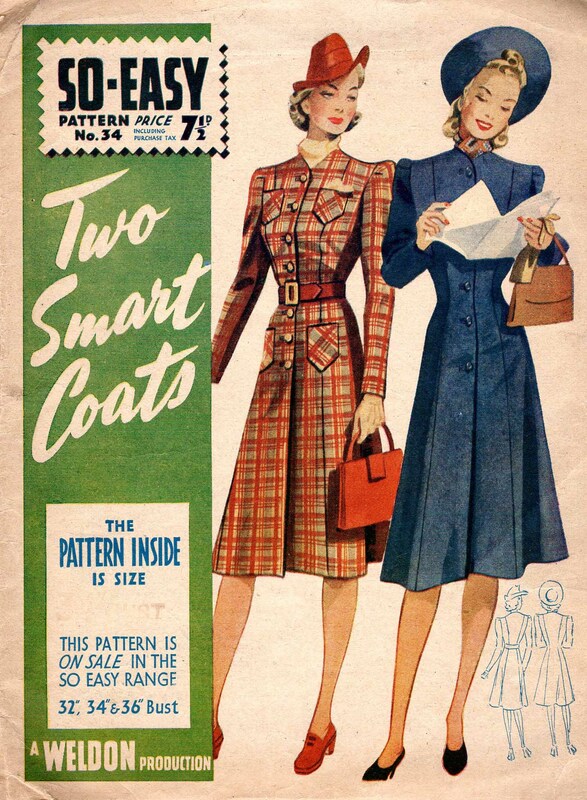 To finish off the weekend I bought 3 vintage patterns. And can now be considered converted to camping… themed camping with shopping anyway. No giant arachnids spotted either… though I didn’t want to spoil the trip by looking too hard. I’ve long had an aversion to blue and purple rip-stop nylon and sleeping bags make me feel claustrophobic so after a couple of nightmare camping trips (flash back to 10 years ago, France- giant spiders in the loo’s and mad foxes trying to break into the tent. 8 years ago, Pembrokeshire – 3 days of torrential rain, 2 grizzling children and more giant spiders in loo’s) I’ve held my ground and flat out refused to go. But this time we were equipped with a huge comfy air mattress and brought rugs, duvet, quilts, decent cooking equipment and even a tea-light chandelier … tons of kit, a bit like a minor Royal Progress and definitely not what you’d call economy camping but I loved it this time! Gah!! So cute! I love the brown jacket with the cute little felt cap. If only we lived near each other I could have lent you my 1940s picnic cocktail set for your excursion. Tnx Nina… I think the spiders were repelled by all the hairspray I used. Glamorous camping. You rock the look! You bet! And go shopping? ?